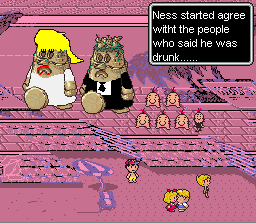 Okay, so let’s take a look at what else has happened in the world of EarthBound around the Internet this past week. EarthBound Review – An RPG experience unlike any other. Elvis ate my toast so I can’t possibly keep up with every single thing that happens in the EarthBound community, so if you’ve done something cool or if you know of something cool that belongs here, let me know! The big merch news this past week was the EarthBound prototype/review copy that sold for almost $600. Hopefully we’ll hear more about that in the future? 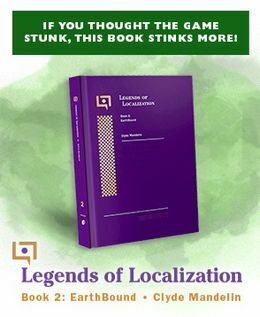 One thing I’ve noticed these past few weeks, especially this week, is the lack of EarthBound Player’s Guides everywhere. There’s a lot less of them for sale lately. Is everyone buying them up, or is everyone hoarding them? Or were they all tossed into a big book fire? You know, I bet there’s some warehouse somewhere with a whole bunch of new copies of the guide. Let us seek it out and plunder it. Anyway, here’s some cool EarthBound merchandise that showed up on eBay this week. You can also see all the EarthBound / MOTHER stuff on eBay all gathered in one handy place here! Official MOTHER 3 Mr. Saturn Plush, brand new – these are starting to get rare again too, so this is probably the last chance to get one for a questionably reasonable price. Unless they do another run of these in Japanese arcades, but I don’t expect that to happen. BTW, if anyone knows how to differentiate between a 2006 Mr. Saturn plush and a 2009 one, please let me know! Not too much of interest this week, though he did say one day he wondered how many onigiri he had this year. He gave his estimate, then talked almost philosophically about the procuring and eating of them throughout a year’s worth of time. In the end, he’s not sure how many he’s had after all. I wonder if my parents are looking for good deals on Earthbound carts.. I lol’d at the fluke. …Oh boy. There are so many things wrong with that picture, I’m just giving it the WRONG label right now. I liked that Junior High band names thing. Every single character sprite is wrong in that picture, or they’re not suppose to be there. The background is fine though. And obviously the text, which is hilarious. NOTHING is wrong with that picture, what are you people talking about? I remember it distinctly from the game. B.- There is no Dungeon Kid (yet). I think the trippy Tane Tane Island music would be perfect for a moment like this. No Tracy! You’re just young and confused! That picture is the best thing ever. Here’s what’s wrong with that image. Dungeon Woman is dressed as the groom and Dungeon Man is dressed as the bride. Dungeon Man’s wig does not go well with his eye color. Mr. Venus’ backing vocal #3 is singing in B flat while everyone else is singing in C.
Tracy seems unaware that rubbing her nose on Pokey’s causes 36 types of status effects. No toast is safe from Elvis! Hide those toasters that toast toast! Yeah, I liked that line a little bit too much. The only thing wrong with that picture is that there’s isn’t more of them in existance. Mato, if you have any truly clever and funny flukes in your vault, you should bring them out. I think I’ve seen, like, one. Ever. Um. I don’t remember where. For a while it seemed like a law had been passed somewhere which required all flukes to contain a wildly inappropriate mech, preferably the one that sorta looks like a bee that gets blown up by Mega Man X and Zero during the beginning cutscene of Mega Man X3. Or 2. In any case, all you had to do was throw it in a random scene from EB, and hilarity apparently ensued. I suppose hacking made flukes more or less obsolete…like Betamax. Actually, while I’m still yammering away, I may as well mention one more thought that crossed my mind: a brief history of Earthbound hacking for non-hackers would not be unwelcome material here. Speaking for myself, of course. YOU GUYS FORGOT 1!He forget to put in the sentance starter dot. hahahahaha, correct! I think it’s right after the scene where Ness wets his pants in the Topolla theater. And then has to fight Link and Mario and Kirby to get to the flaming pile of Mr. Saturns. Best fluke I’ve seen yet! There is nothing wrong with that fluke because it’s perfect in every conceivable way. Yet, over all these years no one ever pointed out the magic cake background. Was that just supposed to be like that or did no one find it?